On my first day of teaching at Kiambogo Primary School in Kenya, I was asked to teach second and third grade as their teachers were at a government-sponsored seminar. I asked the children to get out their English books. The students pulled out notebooks. I said, “No, no. The textbook.” I held the one I’d been given aloft, and they were perplexed. Turns out, I had the only one. Luckily, the situation isn’t that dire. The government provides some funds and parents/caregivers pitch in what they can. Books arrived early the next week, but it still isn’t nearly enough. As I write this in the teacher’s lounge, I sit across from score results from the end of term exams for the last 14 years. Every five years or so, there is a spike in the scores. Why? In those years, the number of textbooks is sufficient for students to have their own, and studying at home and doing homework is possible. 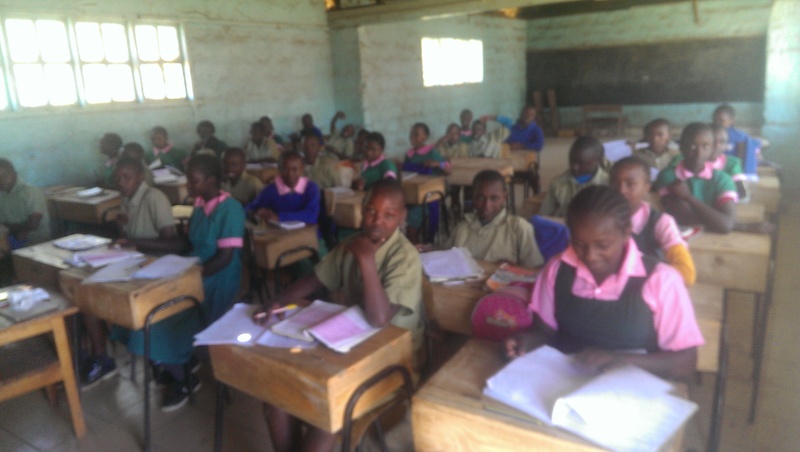 Click here to help the AACC raise funds to provide textbooks for each child. If you want to learn more about the area your helping, run a Google search on Kijabe (I’m assuming you have easy access to a computer and electricity). This area is home to many IDPs (Internally Displaced Persons); people who were forced from their homes by war in 2007. It was here that I learned that Harambe isn’t just a Cincinnati zoo gorilla. Harambe is a Swahili word that translates to a community of people helping each other when and where they can. I have been taken in and cared for in the harambe spirit. I invite you to join us. Some of you can donate. Surely all of you can hit the share button on Mama Beth’s Book Project.